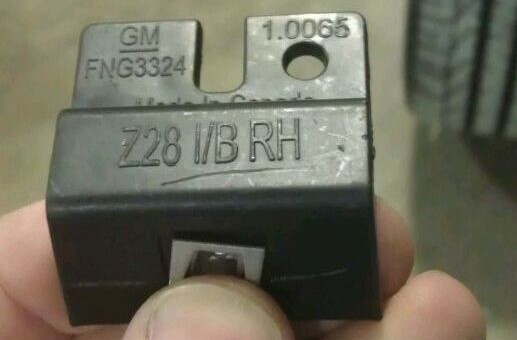 Chevy Camaro Z/28 Label Found On ZL1 Bracket, Coincidence? The guys chiming away in the Camaro5 forums have been debating with great interest as to why the mounting brackets on an accessory diffuser for a Chevy Camaro ZL1 are labeled with the Z/28 alpha-numeration, supposedly along with the side skirts. What does this mean? It could mean that the ZL1 was called the Z/28 back when the suppliers were developing parts before its unveiling in Chicago last year. It could simply be that simple. Or, we’re all in for a pleasant surprise down the road. Which would not be very surprising, as reports dating back to last year claimed that the Z/28 will still once again show its face. Then the 1LE was unveiled. Are all bets off? Or maybe it’s an part number used interally by the part maker. I mean I found a phone number on the back of a bag of Skittles once. A “consumer inquiry phoneline” wasn’t the chat line I was expecting. Worst of all, they were Tropical Skittles; the worst! I mean it was an impulse buy anyway and I was in a hurry to get on the highway before the traffic got heavy, but I KNOW my hand reached into the red Skittles box at the counter and not the blue Skittles box. I was so irritated when I got back in the car, I couldn’t bring myself to go back in and get a straight exchange, plus I didn’t get a reciept. It didn’t help things when I got onto the highway and ended up finishing the bag anyway, even though it was most disatisfing. Anyway, that’s what this “Z28” part thing is to me; Tropical Skittles and not a clear indication of anything more.